A collection of New Wave Nocturnes, these "80s Lullabies" find the beating heart in the overly-familiar period arrangements of retro-Brit-pop favourites and translates them into smart, dreamy - and original- pop soundscapes. The Big Bright is the new musical collaboration from Glenn Patscha and Fiona McBain of Americana stalwarts Ollabelle, and Liz Tormes, critically acclaimed, neo-noir singer/songwriter. Formed around a shared guilty pleasure—vintage New Wave and ’80s Brit-pop (think Depeche Mode, Tears for Fears, The Cure)—The Big Bright finds the beating heart in the melodies, lyrics and frailties hidden in the overly-familiar, period arrangements of retro-pop favorites, translating them into smart, dreamy and original contemporary pop soundscapes. Originally conceived as an album of lullabies for children and new parents, I Slept Thru the '80s transformed itself into much more. We realised that even though we lived through the 1980s, we had slept through how beautifully melodic, gentle and profound the songs were. This recording then became about distilling the period arrangements alongside our memories, and we came up with this... a collection of New Wave Nocturnes - night music for all. 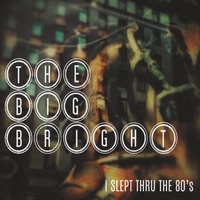 So, as children are wont to do, sleep and wake and drift into sleep again, or maybe just relax and chill to The Big Bright's "I Slept Thru The '80s". "I Slept Thru the 80's" is Produced and Arranged by The Big Bright. With thanks and gratitude to the original songwriters and performers.. and the 1980s.